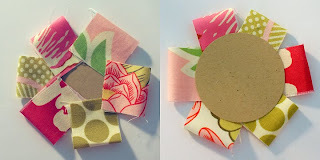 Studio Calico: Tutorial: Fabric Scraps! My office is a mix of scrapbooking paper products and sewing/fabric goodness. I have boxes and bags of fabric scraps (from past sewing projects) that I can't bear to throw away. Instead, I've found a variety of ways to incorporate the fabric scraps into my paper projects. The first technique is a super simple fabric flower. Start by punching a large circle from cardstock - this circle punch would work great. 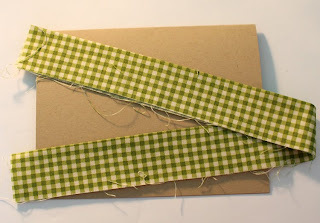 Next gather a variety of small fabric strips, loop them in half, and adhere around the punched circle. This adhesive in the shop would work well. After adhering fabric scrap loops around the circle, flip it over. 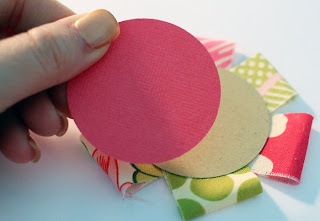 Punch another circle in the same size, and adhere to the top of your fabric flower base. Accent the center of your flower with smaller punched circles (from cardstock), or scalloped punched circles, and even with small crocheted flowers and rhinestones. 3D Dots work really well for adding extra dimension in your flower centers! The second scrappy fabric technique on my card is a fabric ruffle. 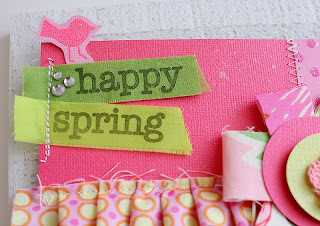 This is an easy element to add to either a card or a scrapbook page. 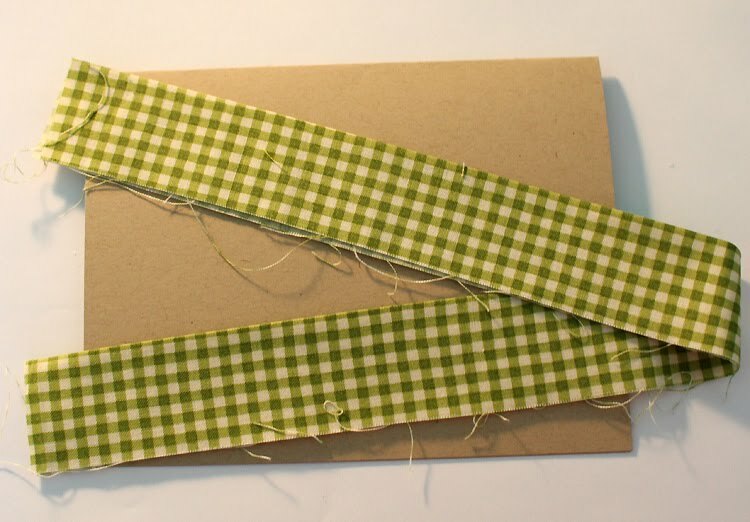 Start with a strip of fabric that is at least double the length of the card or page that you will be stretching it across. Using a strip that is folded in half lengthwise (like my green gingham strip) will add additional volume to your ruffle. Lay ruffle strip along your card and start stitching at one end. 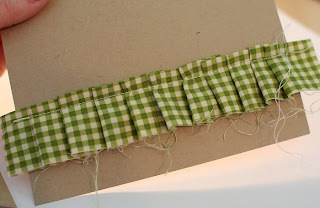 I start with a straight stitch up until the point where I'd like my first ruffle pleat. Also, I find it easiest to work with my sewing machine needle set to stop in the downward position (if this is an option on your machine). 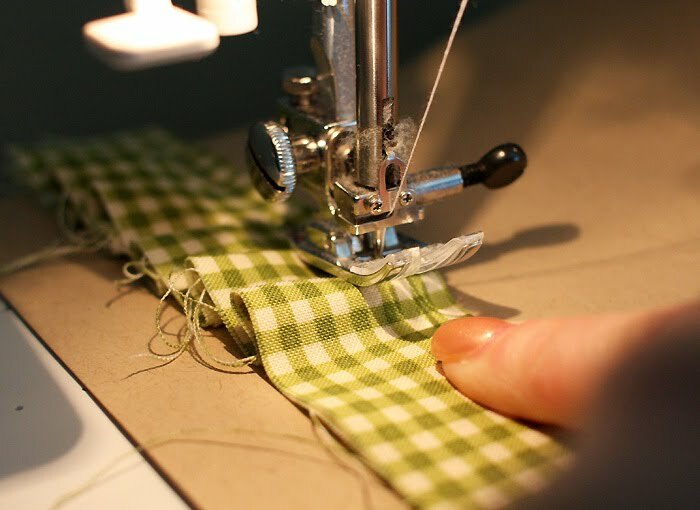 Then I simply stop stitching where I'd like a ruffle pleat, and raise my foot, fold some fabric inward, lower the foot and continue stitching until the next point that I'd like a ruffle pleat at. Continue this process across the width of your paper project. Finished ruffle may need to have a few loose thread and ends trimmed once finished. Stamping is the third and final scrappy fabric technique included on my card. 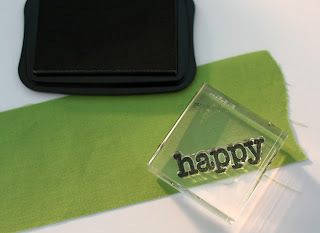 Stamping images directly onto fabric is a great way to get yet another use out of your stamp collection. 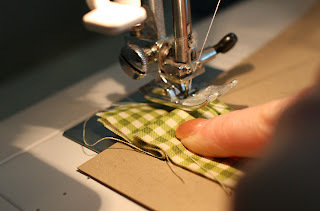 Stamping onto fabric is very easy - just stamp as you normally would onto paper, but use fabric instead! 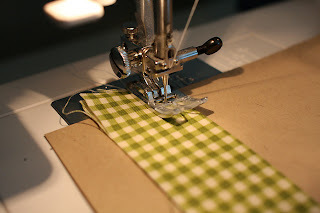 A few tips: I've found it's best to iron your fabric before stamping, to make sure that there are no creases - and, Staz On Ink works the best on fabric in my experience. After your card sentiment (or image) is stamped onto fabric, use a sharp pair of scissors to trim your image. Fray edges as desired. 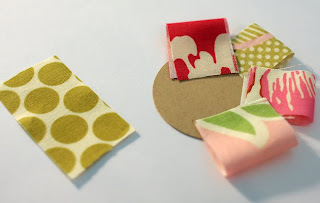 Stamped fabric can be glued or sewn to your paper project. I also added a tiny bird (stamped and embossed) from the new-to-the-shop "Tweets" stamp set, sitting atop my card greeting. LOVE this stamp set - it's absolutely perfect for spring projects! 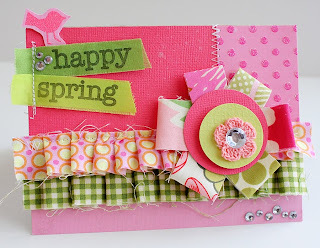 My finished card... Hope that you enjoyed my scrappy fabric techniques and that you try one out on a project soon! i adore you & your beautiful work! what a great tutorial!!! Cant wait to get my hands on some cute fabric I purchased weeks ago...your card looks so cute. Love your tips about fabric! 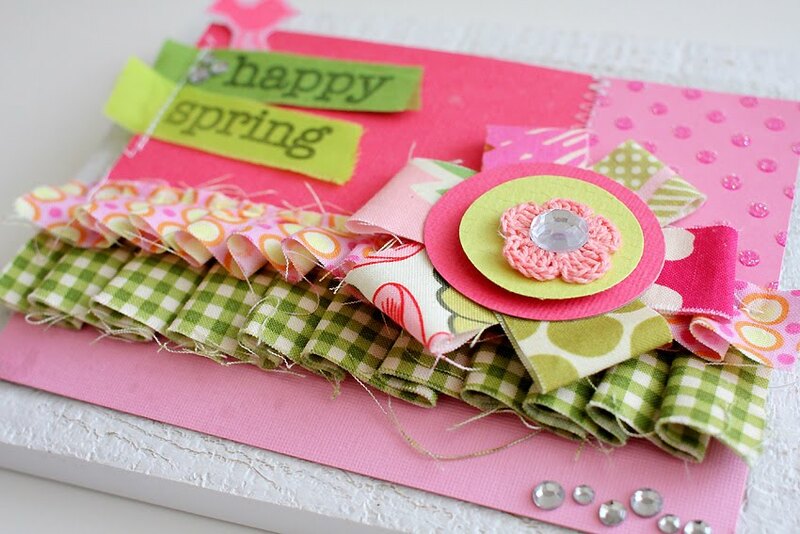 And this card is so bright and yummy! Thanks for the inspiration! And I am so into fabric these days so this is super inspiration! Awesome card and great techniques! This card makes me smile and also go out and get fabric! That looks so fun to make!!! 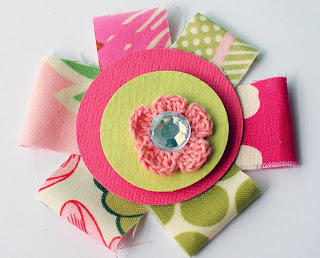 Thanks so much for the tutorial on how to make your flower and ruffle! 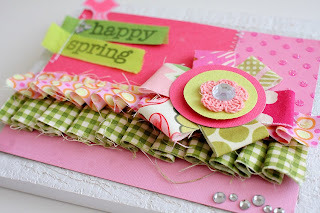 I love sewing on cards and am always looking for new ways to use fabric. I love making fabric flowers. Awesome! I have lots of fabric scraps to use and this helps! Thank you! cute, cute card! 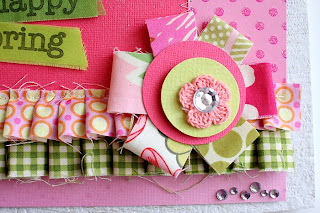 i too have lots fo scraps, will have to use more of them!! TFS! The happy stamp is a nice sixe. its nice to see it in proportion to the stamp block. TFS! Now I really want the add-on even more for that cute little stamp! So cute! Loving the fabric craze! This is beautiful! :) I looove the texure that fabric brings to projects! :) Lovely!